We have finally updated our homepage, which is much easier to navigate. It is on a WordPress system and we (Peter Lindemann & Aaron Murakami) will be able to easily put in some blog posts and refer you to them instead of making these newsletters so long. For now, we’re just testing out re-posting some interesting news items and will soon be putting in some of our own articles. This free ebook is worth hundreds if not thousands because that is what you can save over the years if you actually apply the information. 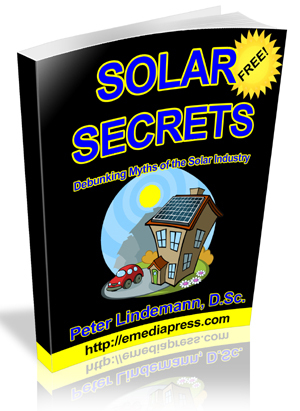 If there is something that can be done wrong with popular solar power methods, it is! That’s an unfortunate but true fact so make sure you get a copy as soon as we release it because it may only be free for a limited time! p.s. I’ll send a link soon to a demo that is related to Paul and Jim’s talk!